As an Entrepreneur, this is the time for you to step forward boldly and reimagine how you can draw information on your personal business with like-minded business leaders. WNW Leadership Networking forum is fueled with successful woman who will be transparent with how they broke through fear and overcame many obstacles to structure a business that ultimately changed their lives. As you indulge in delectible bites wholesome discussions these individuals will help you and your business gain refreshing new ideas and a support system that will bring you closer to your dream. The Ultimate goal of WNW Leadership forum is to reinvigorate you and help you to leave with the JOY of also being a business leader and taking strides to build a legacy. Women Networking Worldwide will host the first of a series of panel discussions on a variety of subjects, beginning with leadership as the first. In recognition of women leaders who are creating their own paths in the world of business, and making their entrepreneurial dreams real, we will be joined by a group of women with insight on leadership. The forum highlights include a panel of women entrepreneurs who will showcase their best business practices and tools for success. 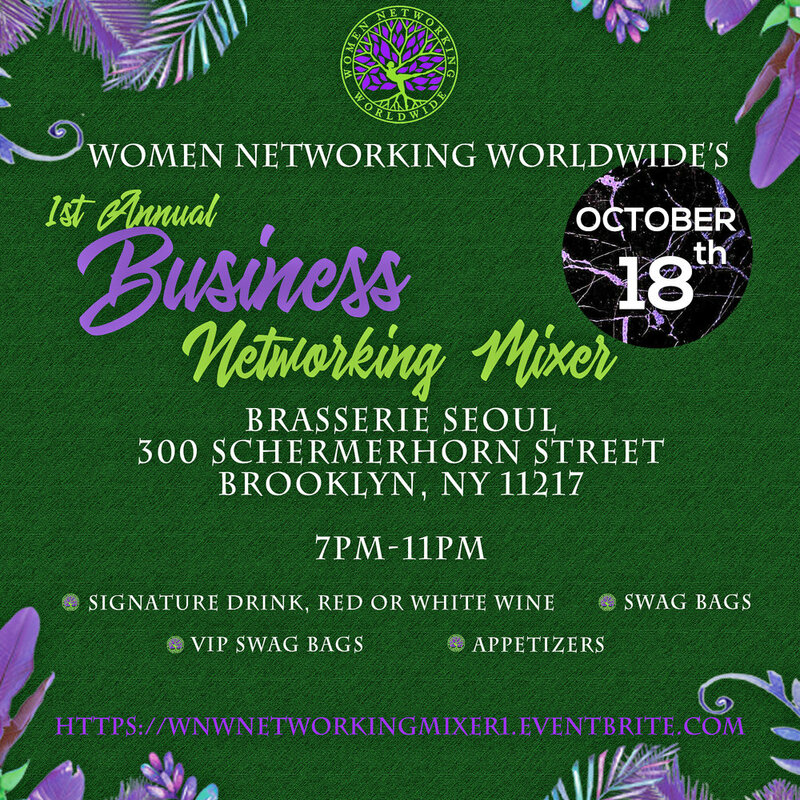 Join Women Networking Worldwide and connect and mingle with inspirational individuals, powerful CEO'S, and successful entrepreneurs who will inspire and provide tools to help your business venture. This is not just an ordinary networking event, WNW purpose is to provide women businesses nothing but endless opportunities with mentors that will provide you a roadmap to endless opportunities. It's a celebration of diverse women engaging on a creative platform. ALL Women & Men are Welcomed! Thursday, October 19th, 2017. RSVP is a MUST via Eventbrite. In addition to the mixer, we will be collecting proceeds through our raffles for our Puerto Rico Humanitarian Relief efforts. *Donations are NOW being accepted via our Eventbrite link as well, for those that cannot attend the event. Join Women Networking Worldwide and connect and mingle with inspirational individuals, powerful CEO'S, and successful entrepreneurs who will inspire and provide tools to help your business venture. This is not just an ordinary networking event, WNW purpose is to provide women businesses nothing but endless opportunities with mentors that will provide you a roadmap to endless opportunities. It's a celebration of diverse women engaging on a creative platform.